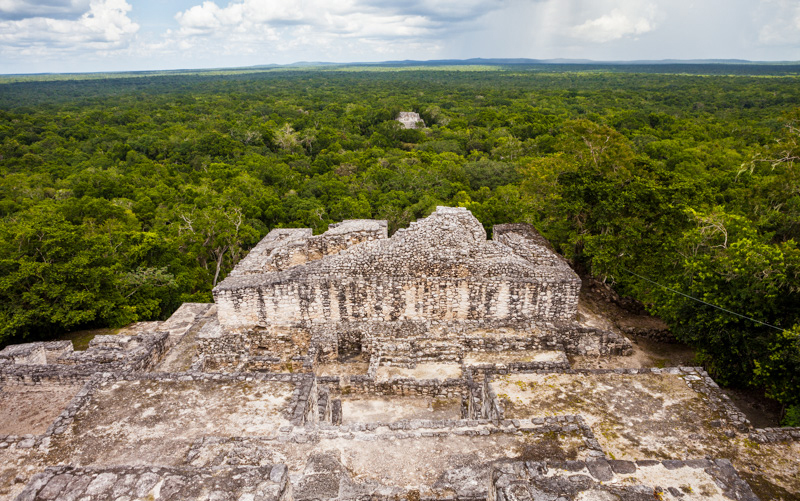 Calakmul is one of the largest and oldest discovered Mayan cities. Calakmul is located in the region of Campeche, just 30 km from the border with Guatemala, this city was inhabited during the years 500 BC and 1000 AD, and was “rediscovered” in 1931 by Cyrus Longworth Lundell. 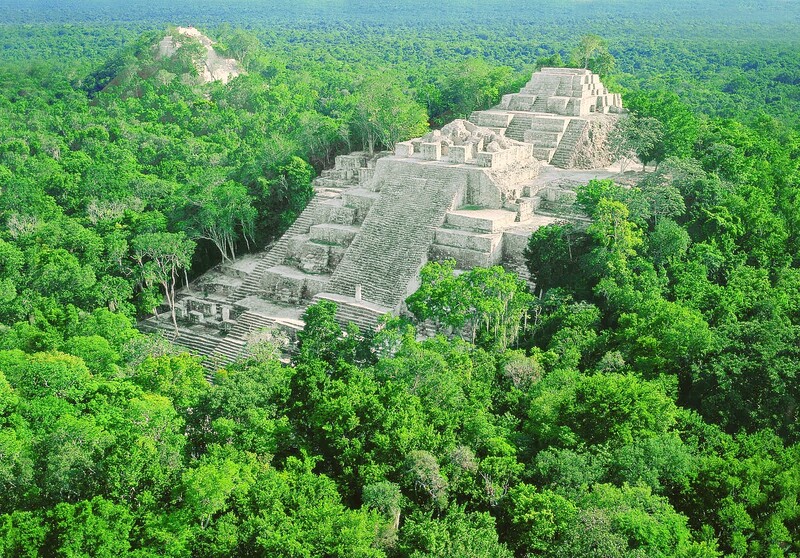 In 2002, the Ancient Maya City of Calakmul became part of the World Heritage of UNESCO. Calakmul meaning City of the two adjacent pyramids, has one of the largest pyramids of the Maya Classic period of 45 meters. This great Mayan city Tikal rivaled the fact that the most important city maya, and political triangle formed Palenque Maya. The Mayan city of Calakmul is within the Biosphere Reserve of the same name, more than 720,000 ha, a place with a spectacular biodiversity. There are about 1500 species of plants, 10% of them endemic, 236 species of birds, of which 75% are residents, 86 different species of mammals, and 5 of the 6 species of felines known Mexico we can find them here such as the yaguarundi or lion, ocelot or margay, ocelot, puma and jaguar impressive, Maya symbol par excellence. With these numbers, just set ourselves a little in the trees around the road during the tour to find the most curious animals, especially insects. The intense humidity of the jungle and the strong tropical heat make this an ideal place for animal life and to the ancient Mayan civilization as Calakmul was the tank rainwater from the Yucatan peninsula, having many gaps in the area. This also makes the place smell like a warehouse, although we are outdoors, or rather, in a lush forest. Walk a few hundred meters in this environment is tired if we are not used, but little effort is richly rewarded as the first ruins that are visited, a small residential area where the houses look and intuit places as familiar as the bed or the living room. Calakmul only been studying since 1993, so that archaeologists are still working and making constant discoveries in the interior of the temples, we can not visit, but if you see from the photographs to show us the guide to the colorful murals and tombs that recall the eastern civilizations. After several residential areas, each with its peculiarities, cross the wall to get to the center of the great Acropolis and one of the biggest attractions of Calakmul, Structure I, a huge pyramid that we can climb, step by step, to marvel the views from the top. Miles and miles of jungle green plain that is lost to infinity, where only a small mountains that may mark the border with Guatemala or Chiapas be spotted, such is the enormity of the landscape, and another pyramid that stands on the orchard, Structure II. Interestingly there is little silence, hearing both wind rocking the treetops as disparate fauna that lives here. 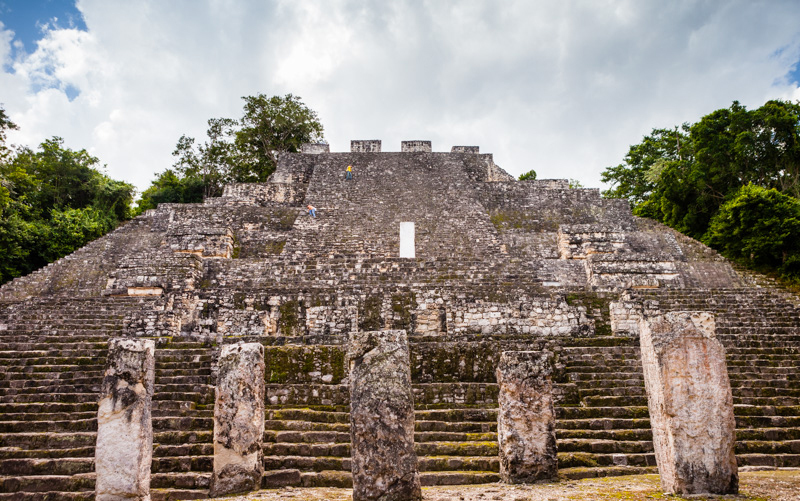 Climb to the top of a Mayan pyramid and feel that perhaps you and your group you may be the only people in the area that the eye is an indescribable feeling, and that in a few places you can experience. Known Structure I, touches repeat experience with the immense structure II, with its 55 meters high it is the second tallest pyramid in Mexico after Tonina in Chiapas. 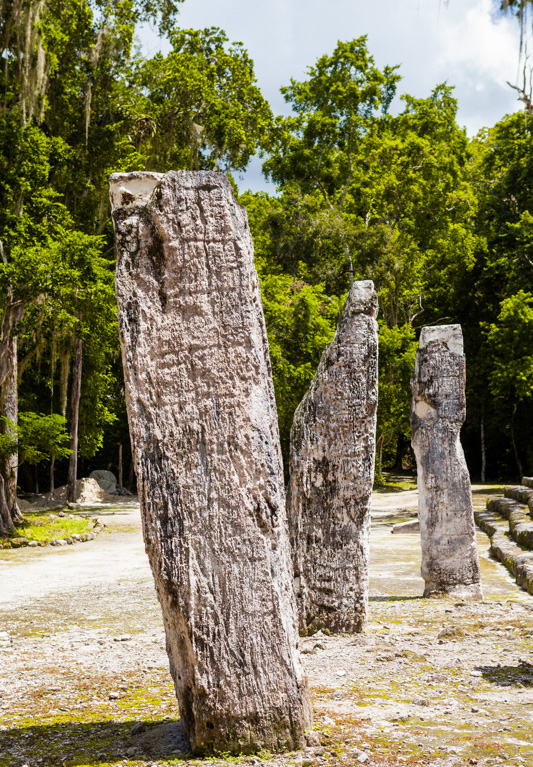 Nothing approaching your base you realize its importance as five trails welcome you, telling you a little story virulent Calakmul and its rulers. Always eternal wars with the relatively nearby Tikal, the other great Maya city of the era, as well as other small towns, in 562 the period of splendor of Calakmul, thanks to overcome many of these wars began. But the good times did not last long, beginning its decline on the 675, after a great loss to Tikal that led to the disappearance of the kingdom of the snake or Kan, who had led the city to its glory days. A drought in 40 years did not help the revival of the city, who lived a long agony until completely abandoned about the year 900, after more than 2000 years giving shelter to 60,000 Mayans. All this is known by the approximately 120 stelae found in Calakmul, large stones that tell parts of the story and the kings showed their power, being the largest collection of stelae found. Up to 55 meters high of Structure II is a bit more complicated than the previous pyramid, rather than the height of the great separation of the steps, and because this building had quarters in their intermediate levels, which makes us stairs to switch repeatedly until you reach the top, where there are several ceremonial sites, and of course, splendid views of the rainforest. From here it is easy to understand why top Cyrus Longworth Lundell gave the name of Calakmul to this city formerly called Ostetun, since in Mayan means “two adjacent mounds” in clear reference to these pyramids that never stopped growing while the city was alive reflecting the view that the Maya had the world. Stelae were to represent trees and pyramids were mountains. 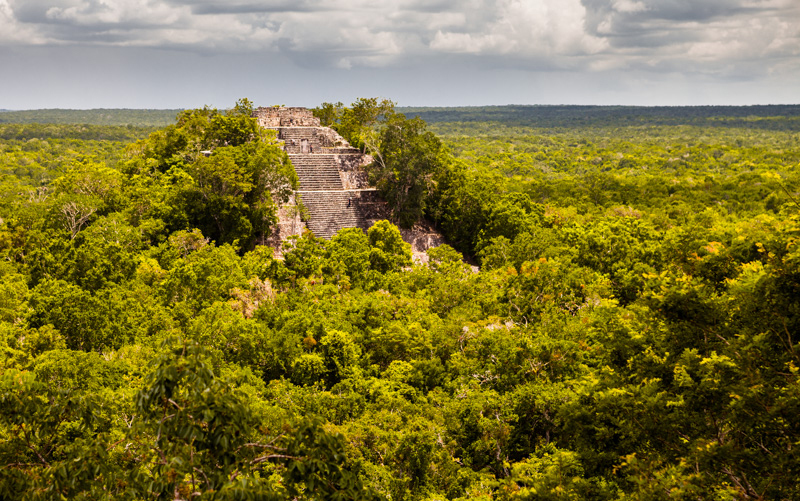 Two hours just give to appreciate the magnitude of Calakmul, which holds great mysteries such as how they managed the Maya to feed so many people on land that is not good for farming corn, their main food. It is suspected that a local nut, known as Ox or plant Ramon (Brosimum Alicastrum) was what they ate to survive, due to its high amount of protein, but still nothing is clear. What is clear is that these are the most isolated and wild ruins around Mexico, where a true adventurers can feel completely alone touring this great city as we imagine wars, parties, romance, rituals and everyday that took place in this small clearing in the jungle inhabited by the Mayas. 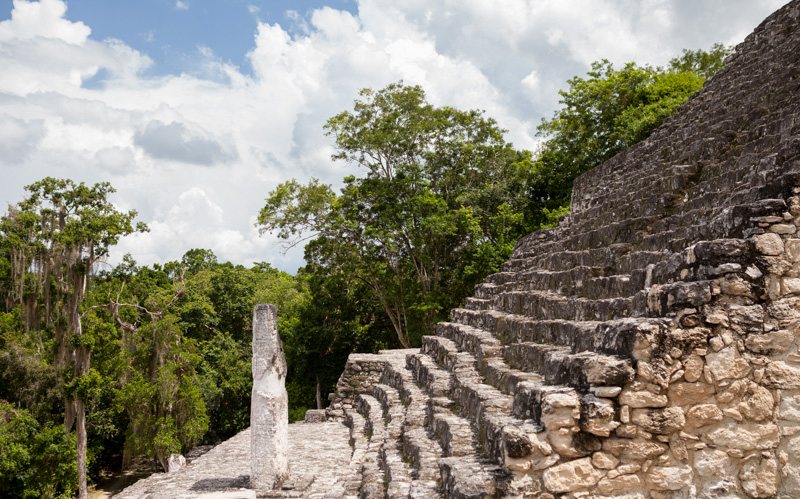 To reach Calakmul, Campeche we recommend going up, which is 300 km from Calakmul. These three or four hours of driving from Campeche to Calakmul is where most Mayan structures in the world are concentrated. From Campeche take Highway 180 towards Champotón-Cd. del Carmen. When you see the sign for Escárcega and Highway 186 Take it and go on towards Calakmul Biosphere Reserve area. Although the roads are paved, are very narrow and winding, and may be that you find iguanas, snakes and other animals in the middle of the road and be a wait to depart. The road ends at a small parking that is the “official” entry Calakmul, from here you have to walk 2 or 3 miles to the entrance of the city. The funny thing is that you’ll be climbing mountains are not mountains in its exact term, but Mayan pyramids or buildings that have yet to be unearthed. Some guidelines suggest reach Calakmul night and start visiting the Mayan city early in the morning (in Calakmul open at 8 am), there are some hotels near the city. You can also find hotels in Chicana, a half hour drive from Calakmul.